Maria Sharapova is a 22 year old phenom from Russia who moved the to US when she was seven. This explains why she speaks English so fluently and with barely a trace of an accent in all those commercials. Sharapova also happens to be the world’s most highly paid female athlete (try $26 million buckeroos). She is a real grunter – it seems like when she can’t out hustle or overpower her opponents, she grunts them into submission. I don’t think she has a boyfriend, but since I have already committed myself to several hundred of the other muscular goddesses here, I just can’t ask her for the hook up. Tennis babe Alona Bondarenko is a blonde tennis player from the Ukraine. She hit a #19 ranking back in 2008, so she ain’t bad. She is 24, weighs 130 lbs, and stands 5’6″ tall. She is not a little twig. I don’t think she is a grunter, ie one of those gals that groans and moans every time she hits a tennis ball. She was defeated in Round 1 of Wimbledon this year by Baltacha. Jelena Jankovic currently lives in Florida, but was originally born in 1985 in Belgrade Serbia. She is 5’9.5″ tall and 134 lbs. She is a beautiful young woman, and if you check out a few of those pics you’ll know that her arms and delts are bigger than mine. There is no shame in this, it just means she would manhandle me both on and off the court. One little-known fact about Jelena, she plays piano. I would love to hear a few romantic sounds from her fingertips. Maria Kirilenko, muh muh muh mercy. She’s a right-handed bomber from Moscow Russia, standing 5’8″ tall and weighing 127 lbs. When off-court, her blond hair does an excellent job framing her golden eyes (check them out in the last pic, which is courtesy of her website). Her body is summed up thusly: strong bones wrapped in elegant sinew capped with perfect skin. She obviously incorporates weight training into her workouts. She enjoys fishing, which is nice since I’d love to let her catch me. Daniela Hantuchova is from Slovakia and is about 25 years old. She is 5’11” tall and weighs 136 lbs. She turned pro about ten years ago and has been turning my head ever since. Her favorite surface is grass, and her favorite actors are George Clooney and Brad Pitt. Pitt looks like a rat compared to me, so I’m sure I’ve got a serious chance with this European fitness honey. 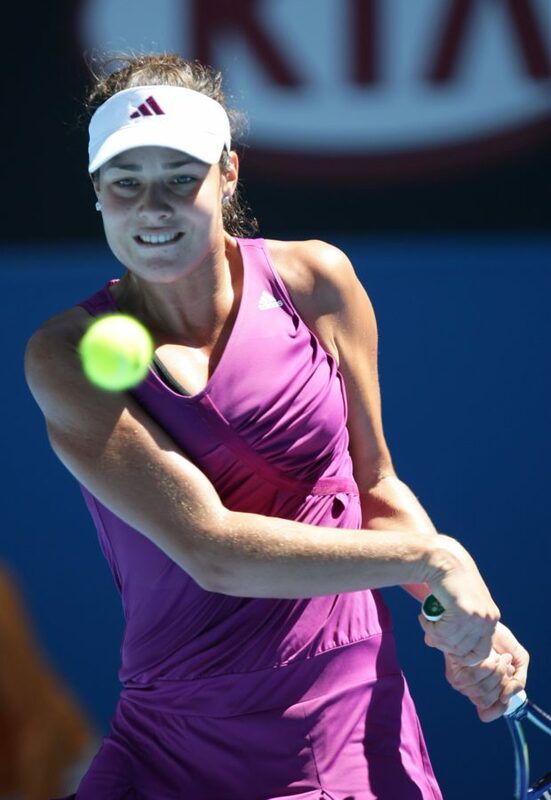 Ana Ivanovic is a stunning tennis goddess. I usually watch tennis matches with the TV muted, so I can’t tell you if she’s a grunter or not. She is 6’1″ tall and weighs 152 lbs. She was born in 1987 in Switzerland. She idolized Monica Seles growing up, and has been playing since she was 5.